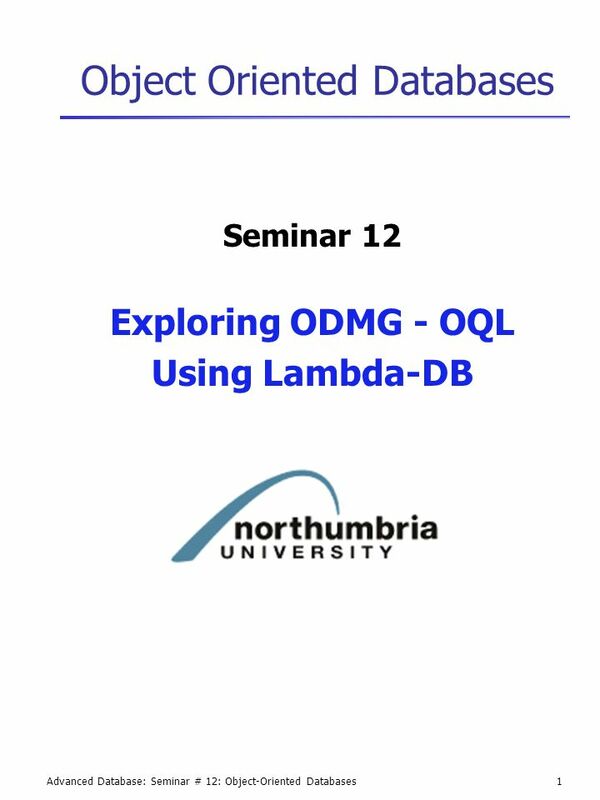 Advanced Database: Seminar # 12: Object-Oriented Databases1 Object Oriented Databases Seminar 12 Exploring ODMG - OQL Using Lambda-DB. 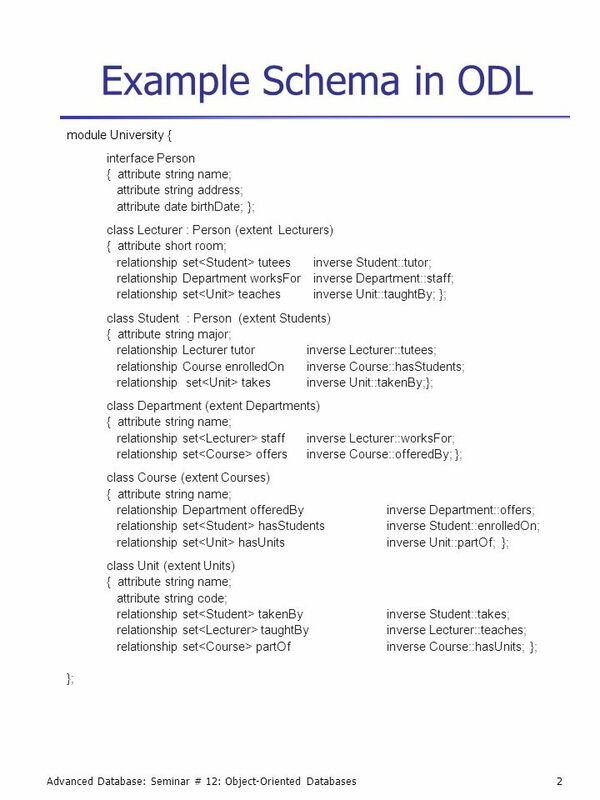 5 Advanced Database: Seminar # 12: Object-Oriented Databases5 Querying using OQL Simple Query Named objects – entry points Path expressions Explicit Joins select l.name from l in Lecturers The query returns names of lecturers such that the type of the result is bag. Departments The query returns all Department objects. The type of the query is set. 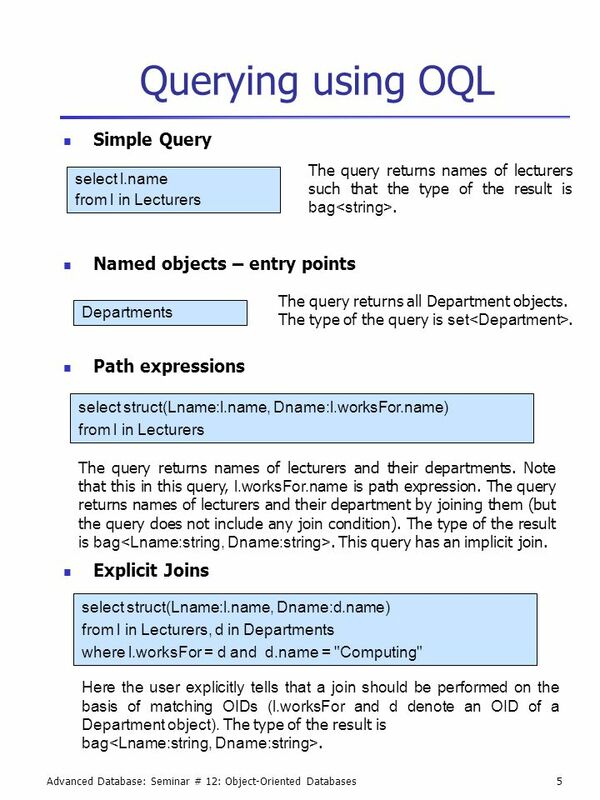 select struct(Lname:l.name, Dname:l.worksFor.name) from l in Lecturers The query returns names of lecturers and their departments. Note that this in this query, l.worksFor.name is path expression. 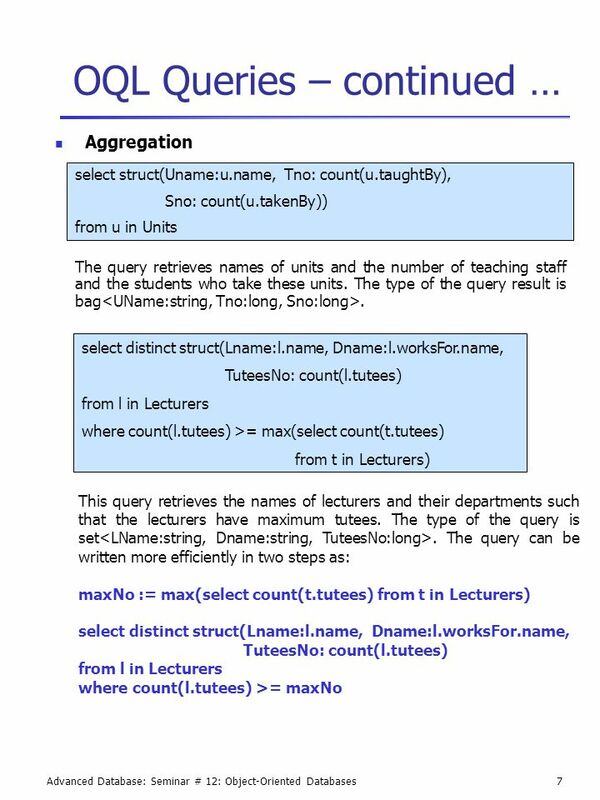 The query returns names of lecturers and their department by joining them (but the query does not include any join condition). The type of the result is bag. 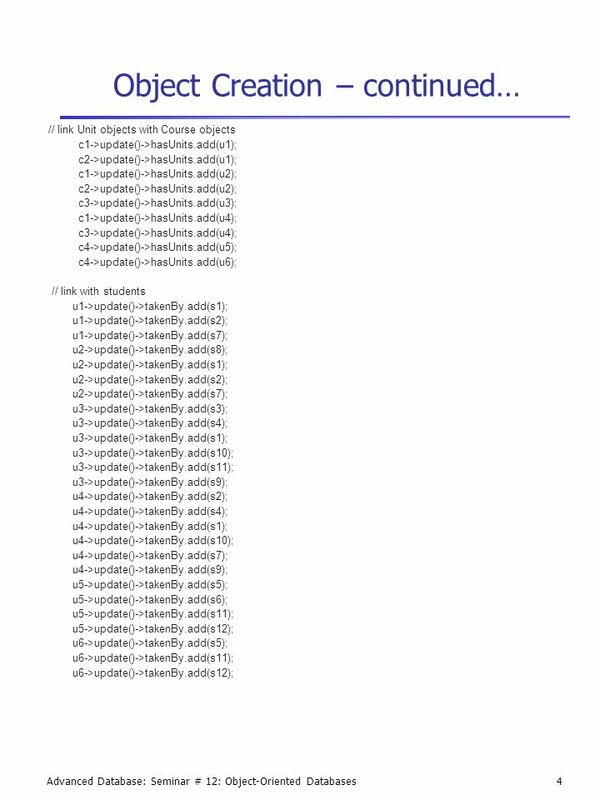 This query has an implicit join. select struct(Lname:l.name, Dname:d.name) from l in Lecturers, d in Departments where l.worksFor = d and d.name = "Computing" Here the user explicitly tells that a join should be performed on the basis of matching OIDs (l.worksFor and d denote an OID of a Department object). The type of the result is bag. Download ppt "Advanced Database: Seminar # 12: Object-Oriented Databases1 Object Oriented Databases Seminar 12 Exploring ODMG - OQL Using Lambda-DB." 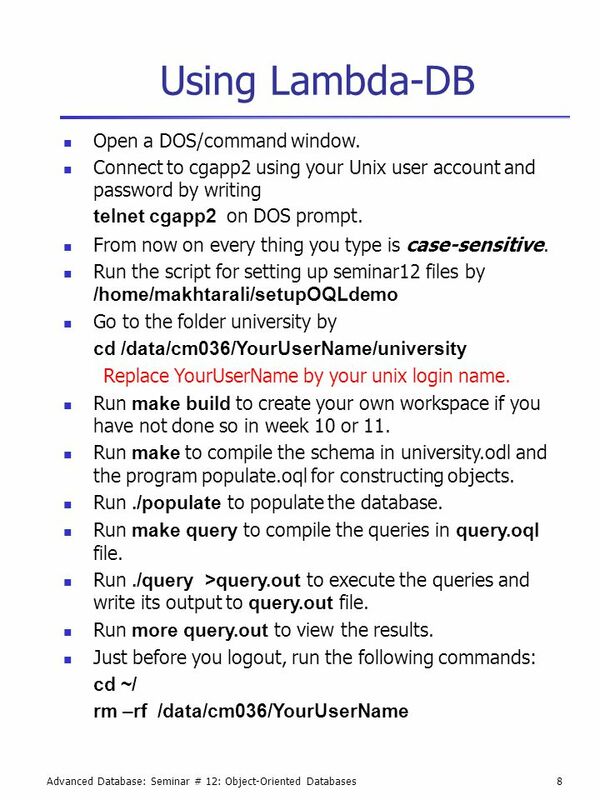 Advanced SQL (part 1) CS263 Lecture 7. PHP and MySQL Database. Connecting to MySQL Note: you need to make sure that you have MySQL software properly installed on your computer before you attempt. Evaluation of Relational Operators CS634 Lecture 11, Mar Slides based on “Database Management Systems” 3 rd ed, Ramakrishnan and Gehrke. Object Databases Baochuan Lu. 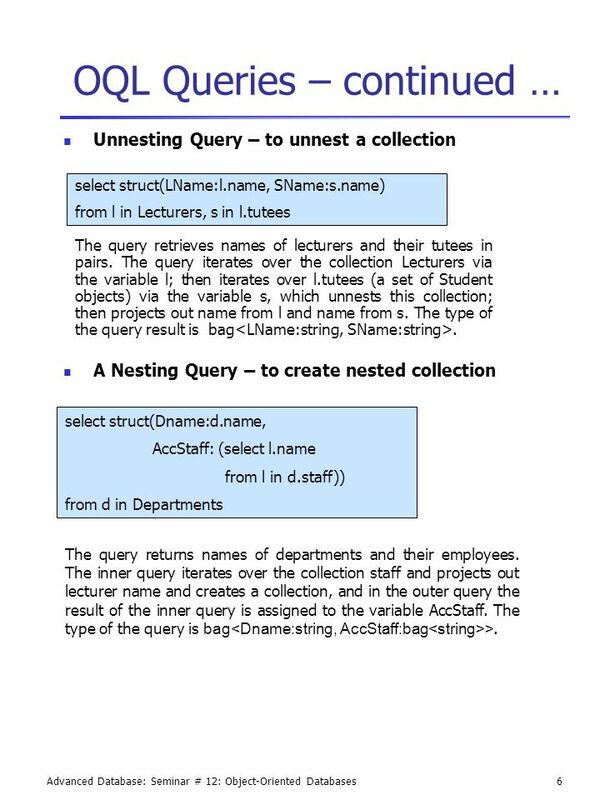 outline Concepts for Object Databases Object Database Standards, Languages, and Design Object-Relational and Extended-Relational. ODMG Standard: Object Model1 OBJECT-ORIENTED DATABASE SYSTEMS ODMG Standard: Object Model Susan D. Urban and Suzanne W. Dietrich Department of Computer. Employee database: Conceptual Schema in ERD Chapter 3, page 62. Inclass Test Revision Database Technology Level I Lecture and Seminar Revision. Programs with SQL Host language + Embedded SQL Preprocessor Host Language + function calls Host language compiler Host language program Preprocessor Host. Copyright © 2011 Pearson Education, Inc. Publishing as Pearson Addison-Wesley Chapter 11 Object and Object- Relational Databases. 1 Announcements Research Paper due Monday November 22. Databases Illuminated Chapter 7 The Object-Oriented Model. 1 ODB Design Handling Associations in ODL M. Akhtar Ali School of Informatics. 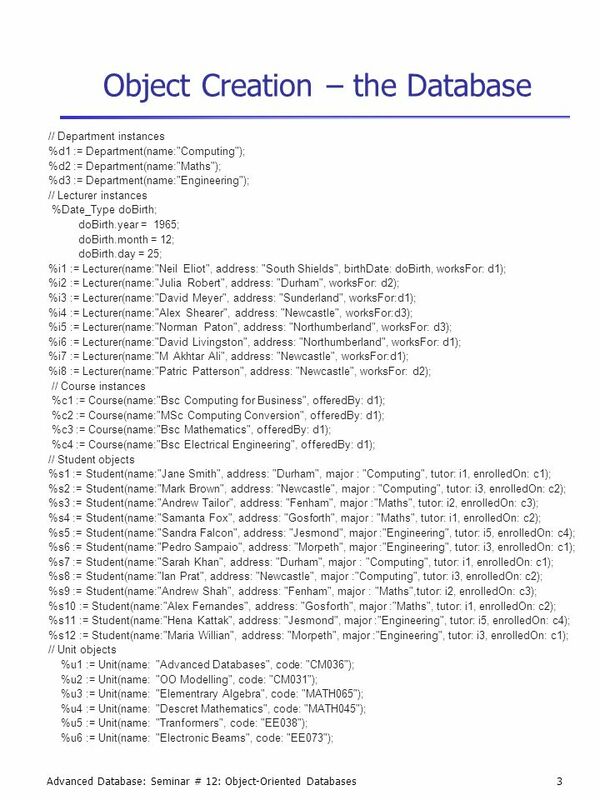 CSE 6331 © Leonidas Fegaras OODB1 Object-Oriented Databases and the ODMG Standard.